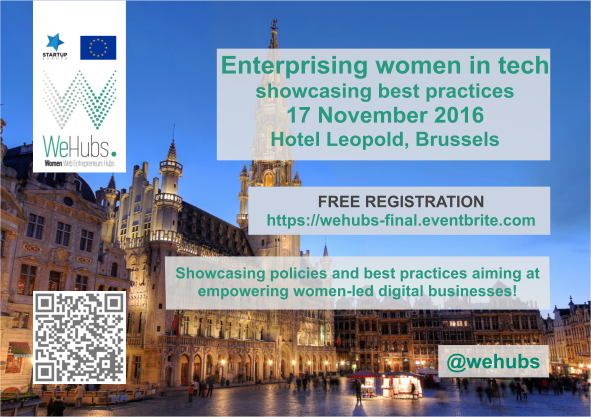 We would like to announce you our final event "Enterprising Women in Tech", which will take place on the 17th of November 2016 in Brussels! Enterprising Women in Tech aims to showcase the best practices coming from business support organisations, local authorities, policy makers and women web entrepreneurs from all over Europe and beyond. The event will include a policy roundtable, to discuss trends on the political agenda about this topic at EU and regional level with the participation of MEPs and relevant stakeholders; pitching session of the 3 finalists from our Ideas Competition and the selection of one overall winner; a panel debate showcasing several business support organisation promoting female entrepreneurship.